1 Peel mango. Cut flesh into thick strips off the pit and cut into cubes. 2 Cut lime in half and squeeze out the juice. 3 Rinse, trim and chop the zucchini. Rinse tomatoes. 4 Rinse cod fillets, pat dry with paper towels and cut into equal-sized cubes. Season with salt. 5 Melt the butter in a small pan. Stir in 2 tablespoons lime juice and pepper to taste and remove from heat. 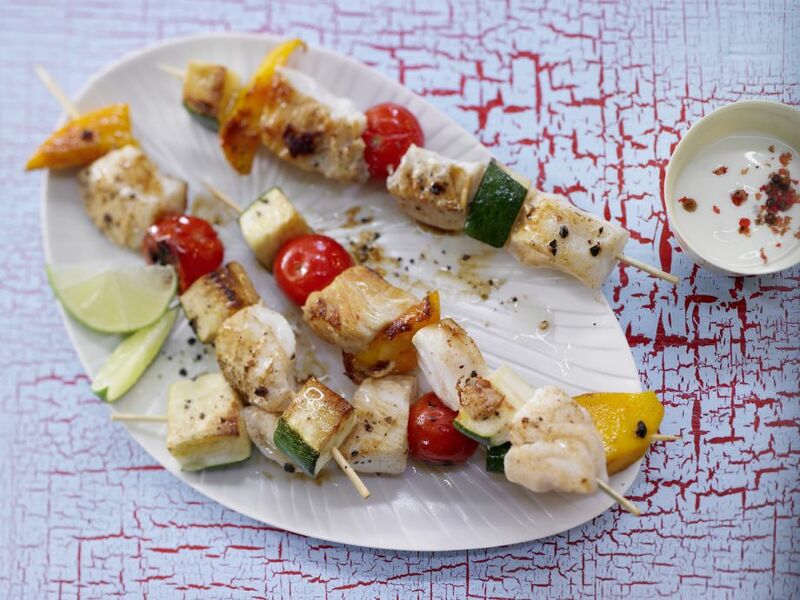 6 Thread fish cubes, mango, tomatoes and zucchini on wooden skewers and brush with the lime butter. 7 Place skewers under a preheated oven broiler or cook in a grill pan for 7-8 minutes. Turn once halfway through cooking. 8 Meanwhile, lightly crush the peppercorns with a knife back and mix in a small bowl with the yogurt. Season with salt and remaining lime juice to taste and serve with the fish and vegetable skewers.